Over 90 young musicians filled the stage of the Stevens Center in the middle of downtown Winston-Salem for a rewarding concert of familiar works conducted by the effervescent new Music Director of the UNCSA Symphony Orchestra, Christopher Lees. There were two major works on the program, both elaborations of the form of "theme and variations," preceded by the popular Overture to Candide, by Leonard Bernstein. Originally a satire deriding the "Optimism" of Gottfried Leibniz ("Best of all possible worlds"), Voltaire's Candide inspired Leonard Bernstein to write a comic opera to which the overture is one of Bernstein's most frequently played works. Choosing a sober tempo, Maestro Lees led his well-prepared band through the tricky rhythms and catchy tunes without a hitch. The new conductor was joined by new chancellor, Lindsay Bierman, the eighth in the 50-year history of the University of North Carolina School of the Arts. Chancellor Bierman narrated the Young Person's Guide to the Orchestra, by Benjamin Britten, subtitled "Variations and Fugue on a Theme of Purcell," eschewing the original documentary text for a wittier version prepared for the occasion. 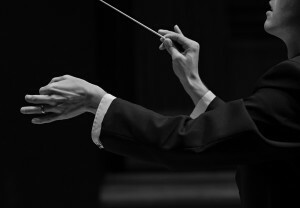 Taking his cues from the maestro, the chancellor likened the four sections of the orchestra (woodwind, brass, percussion, and string) to tribes. The violins were compared to the "vampire, which sleeps in a box, melts in the sun and leaves a mark on the neck," and the basses to elephants at the beach, much to the mirth of the large and youthful audience. The orchestra played well; especially outstanding were the clarinets and bassoons, and there was a very special moment as the cellos softly began their limpid syncopated solo. The massive fugue which concludes the work starts with the piccolo playing a snippet of Purcell's theme, fitted with a long musical tail, and adds instruments in the order they were introduced earlier. It concludes with the brass and lower instruments intoning the original theme (in a binary meter) while the rest of the orchestra plays the fugal theme in unison, in triple meter, making for a delicious rhythmic tension! Maestro Lees is clearly in charge of his orchestra, which responds well to his ever-changing direction. The outstanding playing brought the entire audience to its feet for a well-deserved standing ovation. The second half was entirely devoted to Edward Elgar's Enigma Variations, in which Elgar paints musical miniatures of his wife, a dozen friends, and himself, all incorporating the original theme in G minor in some form or other. This is romanticism at its best – lush, warm, and often dramatic. The few brash moments – a dog thrashing in water, a friend slamming a door behind him – are well balanced by the tenderness which describes one friend's stammer, another's loyalty, and yet another's infectious laugh. In this performance, an overly enthusiastic early crescendo overshadowed the climax in "Nimrod," followed by a histrionic long pause. I was struck by the mastery displayed by timpanist Jaewon Lee, whom I could see clearly from the Stevens Center balcony. I was particularly curious as to how he would handle the passages meant to represent ships' motors in the penultimate variation – the timpanist is urged to take side drum sticks instead of timpani mallets. Often a pair of coins is used, but here, a very short set of sticks were employed and adroitly replaced by mallets when the sudden change back takes place. Principal viola Lanson Wells and principal cellist John Kaynor both played their solo variations with beautiful tone and expression, if somewhat shyly. Congratulations to the viola section, which has doubled its size this year! And many thanks to the School of Music for providing program notes – and to the Stevens Center management for leaving the lights bright enough to read them!